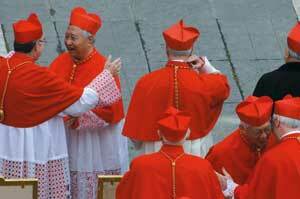 One of the qualifying elements of the first Consistory of Benedict XVI was the conspicuous number of cardinals created from the Church in Asia. Of the twelve new cardinals created on 24 March by Pope Ratzinger, in fact, all of three come from the continent percentually least Catholic in the world: the archbishop of Manila, Gaudencio Rosales Borbon, the Salesian bishop of Hong Kong, Joseph Zen Ze-kiun and the archbishop of Seoul, Nicholas Cheong Jinsuk. Seventy-four year old Cardinal Cheong Jinsuk, a native of Seoul, has been a priest since 1961, studied Canon Law at the Pontifical Urbanian University and in 1970 was appointed bishop of Cheongju, where he remained for twenty-eight years. In 1998, in fact, he was promoted to archbishop of Seoul and apostolic administrator of Pyong-yang, one of the three ecclesiastical districts of North Korea, vacant since the late ’forties. We met Cardinal Cheong Jinsuk at the Pontifical Korean College, in Via Aldobrandeschi, on the north-eastern outskirts of Rome. Your Eminence, how did you take your nomination as cardinal? NICHOLAS CHEONG JINSUK: Frankly I believe that the reason why I was nominated cardinal wasn’t for my personal capacities but because of the particular position of the Korean Church, that has grown a lot by now from all points of view. By now Catholics in South Korea number four and a half million, nine percent of the population, the largest percentage in Asia after the Philippines and Vietnam. How do you explain the Pope’s decision to create as many as three Asian cardinals? CHEONG JINSUK: The first millennium was characterized by the spread of Christianity in Europe. The second by the evangelization of the Americas, of Africa, of Oceania. In his book Arise, let’s go! John Paul II wrote: «Asia: here is our shared task for the third millennium!». 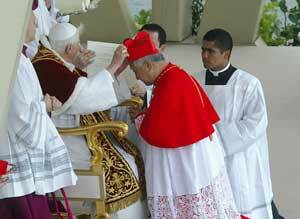 I believe that Benedict XVI’s decision must be seen in the light of that statement of his predecessor. CHEONG JINSUK: I don’t much like comparisons. JINSUK CHEONG: Cardinal Kim, for whom I nurture great respect, found himself facing a particular situation. He had to confront a military dictatorship and a socio-economic situation of underdevelopment. And so he focused his efforts on the defense of human rights. And that gave him much prominence. Now the situation is different. Korea is a democracy and one of the most developed countries in Asia and hence the faithful also demand a different kind of approach from the cardinal of Seoul. Though it’s a fixed point that the Church is and always will be close to the poor, other priorities have arisen. CHEONG JINSUK: Mainly two. First the defense of life from its conception and sharp opposition to any attempt at genetic manipulation. And then to make every effort for reconciliation between the two Koreas. As well as being archbishop of Seoul, you are also apostolic administrator of Pyong-yang. Have you ever visited North Korea? CHEONG JINSUK: No, never. I asked permission, but the authorities would grant it only if I brought a very conspicuous donation with me. It was a figure the diocese couldn’t afford and so I didn’t go. You should know that you can go into the North only if you take substantial aid. In June 2004, for the first time, you appointed an Episcopal vicar for Pyong-yang: Monsignor Matteus Hwang In-kuk. What was the significance of the nomination? CHEONG JINSUK: Monsignor Hwang In-kuk is a native of Pyong-yang: he was expelled from the North as a child with all his family and then he was ordained priest in the South. His main task is to deal with the descendants of the many Catholics that were forced to flee to the South. In the hope that in future he may also deal with the Catholics of the North. Are there priests and Catholic bishops in North Korea? CHEONG JINSUK: No. There’s no knowledge of priests surviving persecution that came in the late ’forties, when 166 priests and religious were killed or kidnapped. The Pontifical Yearbook continues to describe as «missing» the man who was the bishop of Pyong-yang at the time, Monsignor Francis Hong Yong-ho, who today would be a hundred years old. It’s a gesture by the Holy See to point to the tragedy that the Church in Korea has suffered and is still going through. Do Catholic believers and churches still exist in the North? CHEONG JINSUK: Before 1949 there were 55,000 Catholics in North Korea. When the persecution was unleashed many escaped, but many were killed. Today some say there are still a thousand Catholics, other say there might be three thousand. But there’s no certain knowledge. The churches were all destroyed, though when the Olympics took place in South Korea, suddenly one was built in Pyong-yang, out of nowhere… But it was no miracle: it’s easy to see that it was a move by the regime in an attempt to show that in the North there were Catholics also free to profess their faith. Which obviously doesn’t match up to reality. CHEONG JINSUK: A so-called Catholic Association headed by a layman, Jang Jae-yon, who has recently also been appointed president of the North Korean Red Cross. Do they celebrate mass there? CHEONG JINSUK: At times, when there are priests passing through. It happened, for example, last year when the late-lamented Pope John Paul II died. By chance a Korean priest from an American diocese, from Texas I think, happened to be there in those days, so celebrated a mass in suffrage for the dead Pontiff. So priests are allowed to enter North Korea? CHEONG JINSUK: Yes, on the condition that – as I already said – they bring aid. But the authorities don’t allow any fixed presence, though some priests had offered to become such. Has the Korean Church sent much aid to the North? CHEONG JINSUK: In the last ten years the Korean Catholic Church has sent aid, above all foodstuff, to the value of eleven million dollars. Has the aid effectively reached the people? Are there representatives of other Christian denominations in North Korea? The Korean Church is rich in vocations and has sent missionaries to many Asian countries. To China also? CHEONG JINSUK: Officially not. What I can say is that there are Korean nuns in Manchuria who engage in social work, without however wearing the religious habit. Your Eminence, are you optimistic about future reunification of the two Koreas? CHEONG JINSUK: We hope and we pray it may happen. For myself, I repeat, I shall try to do my best to encourage the process, under the sage guidance of the Holy See. Now that the Holy See and China are trying to converse, I believe it can have a certain influence on relations between our two countries. But only the Lord knows when.